In Joan Rivers: A Piece of Work, we hear a line that I think best captured the type of comedienne she was. If memory serves correct, she was on the phone with someone and asked if she thought she should refer to (or could get away with referring to) First Lady Michelle Obama as 'Blackie O'. In turns shocking and funny, I remember both gasping and laughing at this quip. Joan Rivers was a trailblazer, was a legend, but she also found those types of accolades both dismissive and insulting. She never wanted to be held up as some figure who did much to put female comics on equal par with men. Joan Rivers, above all else, wanted to be taken seriously, which given her line of work is a curious paradox at best. It does seem strange that the death of an 81-year-old is considered 'sudden', but then Joan Rivers appeared to be totally unflagging. She had finished a concert appearance the night before she went in for what should have been routine throat surgery, and she had bookings in Great Britain for another tour (which, in her characteristic style, she had dubbed Before They Close The Lid), and she was a weekly presence on the television show Fashion Police, where she and her merry minions would skewer celebrities who dared to wear less than the best. Rivers was just so full of energy, of vitality, of a relentless work ethic. With her always being busy (her greatest fear, she said, was in having an empty calendar), it looked like she would go on performing and shocking, that she would keep on asking in her gravelly voice, "Can we talk?" and offer us more "Gossip, Gossip, Gossip". When one looks back at her decades-long career, full of spectacular rises, disastrous downfalls, and astounding comebacks after comebacks, it seems quite shocking that a simple medical procedure, so simple Rivers didn't even bother to go to a hospital but to an outpatient clinic, could have killed her. In a certain way, it seems a horrible irony that she probably would have made a joke about: a woman famous for her voice and her mouth died as a result of someone working on her throat, and a woman who was forever active and on-the-go never regained consciousness after going into cardiac arrest. It seems curious to me that Rivers was so often hailed as a trailblazer in comedy, in particular for female comics, but she never commanded the respect all those that came after her received. In the sixteen years since the Mark Twain Prize for American Humor was established, Rivers was not once honored (or apparently considered for recognition). Somehow, it must have stuck in her craw (or something that sounds similar to 'craw') that people like Tina Fey, Will Ferrell, Billy Crystal, Ellen DeGeneres and most recently, Jay Leno(!?) were honored while she was passed over again and again. When was the last really funny movie Will Ferrell made? Tina Fey? She was the youngest winner at age 40, but while millions of critics love her I never found her as amusing as she finds herself. I find her smug and pretentious, but in fairness I never saw 30 Rock (like most of America), so perhaps Sarah Palin's doppelganger is some sort of genius. Then again, apart from Mean Girls, what can Fey point to and say, "I AM LEGEND?" Baby Mama? Admission? Muppets Most Wanted? Cue those Kennedy Center Honors clips, please! "The Mark Twain Prize recognizes people who have had an impact on American society in ways similar to the distinguished 19th century novelist and essayist best known as Mark Twain." So it says on the prize's official website as the criterion for being recognized. If people can tell me how Ellen DeGeneres, a woman who has made her whole career out of being almost thoroughly docile, has had that 'impact on American society in ways similar to...Mark Twain', please let me know. Joan Rivers was far worthier of recognition than most of the Mark Twain winners, but again despite everything she did, she couldn't get respect. She'd get praise, a pat on the back, but no respect, which was about the only thing Rivers ever wanted. I reject the idea that Rivers was a precursor to people like Chelsea Handler or Sarah Silverman. Rivers was raunchy, sometimes shockingly so, but everyone was in her cross-hairs, especially herself. Handler and Silverman have always struck me not as funny, but as vulgar, vicious, crass, ugly. Rivers had wit behind her commentary, while Silverman and Handler confuse coarseness with cleverness. Rivers never had to be like the men to be funnier than the men. Rivers targeted everyone, Silverman and Handler only target their enemies, making them crabby commentators rather than actual comics. Joan Rivers, if nothing else, was a survivor. 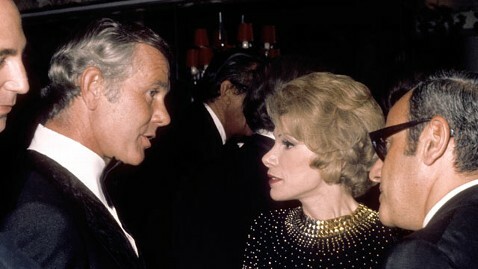 I believe Johnny Carson had in mind to have Joan Rivers take his place on The Tonight Show whenever he decided to finally retire. He had all but put her in the big leagues, and made her his first 'permanent guest host'. When she decided to host her own late-night talk show, things got ugly and confused. No one ever fully agreed on what exactly happened: Rivers insisted she had called Carson to let him know, Carson's camp insisting he was blindsided. His wrath knew no end: not only was Rivers never to appear on The Tonight Show during his reign, but he never spoke to her again. Even after Rivers sent a condolence note to Carson on the death of his son, he steadfastly refused to forgive his protégé, and went to his grave an angry, bitter man (at least when it came to Rivers). Her career was in free-fall: her late-night talk show bombed, she couldn't get bookings, and with someone as powerful as Johnny Carson making his fury clear she had become persona non grata. Add to that the suicide of her husband and it must have looked like it was all over. However, true to the title of one of her books, Rivers found herself Bouncing Back! She went to daytime, and won an Emmy for Outstanding Talk Show host (beating out Oprah Winfrey). In a tearful acceptance speech, the mask she kept on slipped (no pun intended) to reveal a woman who was deeply human, aware of all the chaos she had gone through and to find that at the end she had not just survived but thrived. Later on she would even make jokes about her husband's death, but not out of spite. She truly believed in laughing, one heals. Joan Rivers was funny. She was catty and unapologetic about what she said or thought about people. She knew she was as easy a target as anyone, and she laughed hardest about herself. She knew all her plastic surgeries were fodder for jokes...most of them she made herself about herself. She called them as she saw them, knocking down the pretensions of people she thought should know better. Her quips were clever, outrageous, but always true to how she saw the world. She could shock you, but she never failed to make you laugh (even while you were stunned at what she said). Joan Rivers wanted to be taken seriously: as an actual actress, as a writer, as a person. Sadly, she was never accorded the respect her hard work should have given her. Fortunately, in her efforts at being taken seriously, she ended up being one of the funniest women in America.